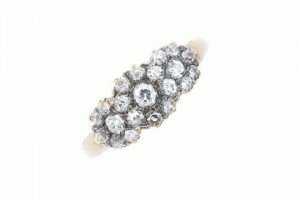 A mid 20th century 18ct gold diamond triple cluster ring. The graduated old-cut diamond triple clusters, to the plain band. Estimated total diamond weight 0.75ct. An 18ct gold sapphire and diamond cluster pendant, with chain. 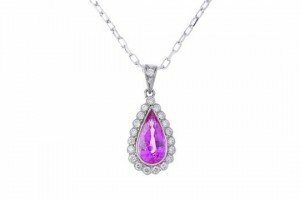 The pear-shape pink sapphire, within a brilliant-cut diamond millegrain border and similarly-set surmount, to the trace-link chain. Estimated total diamond weight 0.30ct. A sapphire and diamond cluster ring. 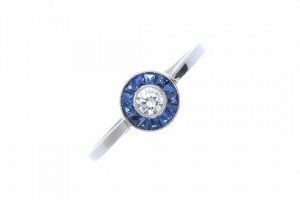 The brilliant-cut diamond, within a calibre-cut sapphire surround, to the plain band. Estimated total diamond weight 0.20ct. A late 19th century lava double-row bead necklace. 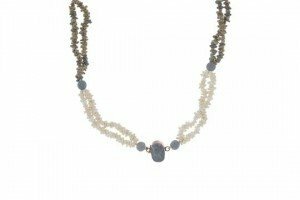 Designed as a series of textured lava beads, each interspaced by carved lava bead lines, of various colours to include white, grey, yellow, brown and black, to the lava cameo gold push-piece clasp. A citrine and diamond cluster ring. 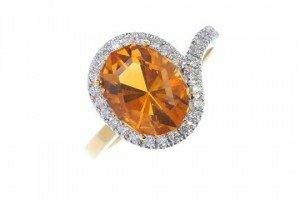 The oval-shape citrine, within a brilliant-cut diamond asymmetric border. Estimated total diamond weight 0.30ct. 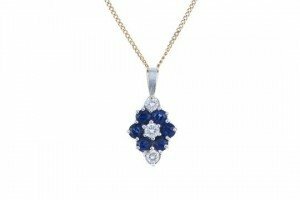 An 18ct gold diamond and sapphire pendant and chain. Of lozenge-shape outline, brilliant-cut diamond and circular-shape sapphires, to the flat curb-link chain. Estimated total diamond weight 0.20ct. 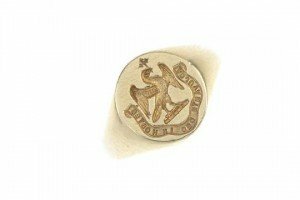 A gentleman’s 18ct gold signet ring. The oval-shaped panel, engraved to depict an eagle crest and ‘adjuvante deo in hostes’ motto ribbon, to the plain tapered band. 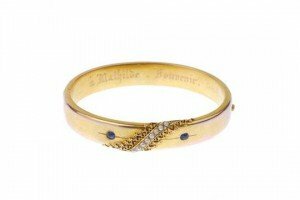 A late 19th century gold sapphire and split pearl hinged bangle. The split pearl scrolling line, with raised scroll border, to the oval-shape sapphire sides and plain half-bangle. Foreign and French assay marks. A diamond cocktail watch. 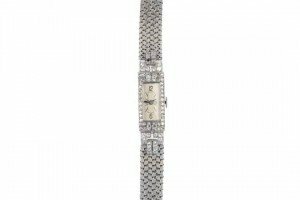 The rectangular-shape silvered dial, with Arabic numeral and baton hour markers, with single-cut diamond bezel and sides, to the textured bracelet. 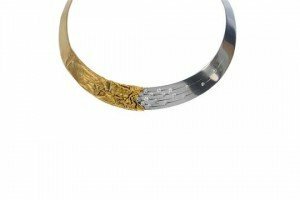 A diamond collar. Of bi-colour design, comprising one textured side and one scattered graduated brilliant-cut diamond highlight side. Estimated total diamond weight 1ct. 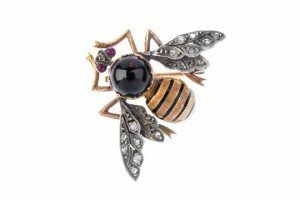 An early 20th century gold and silver diamond and multi-gem bee brooch. The black enamel and textured thorax, to the circular-shape textured body, with diamond point wings and textured legs. 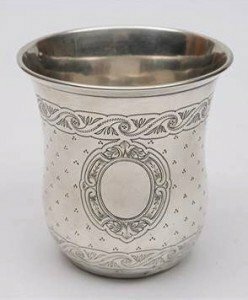 A mid 19th century French silver beaker, maker Cesar Tonnelier, stamped marks: of cylindrical outline, with flared rim and banded floral decoration. 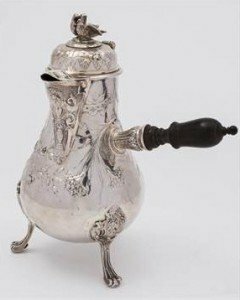 A 19th century French silver chocolate pot: of baluster form, with domed hinged lid surmounted by a pair of love birds, with chased and embossed foliate decoration, with turned wood handle, raised on three scroll feet. 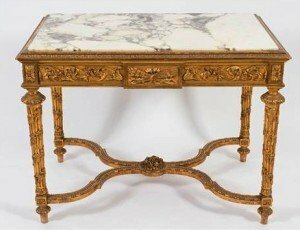 A French carved giltwood rectangular centre table:, the top inset with a panel of onyx variegated marble, the frieze decorated with foliate scrollwork centred by panels with ribbon tied trophies of torches and quiver of arrows, on leaf entwined fluted tapered legs. 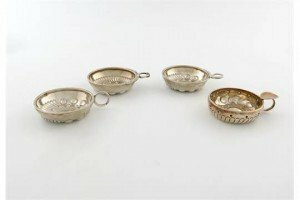 A collection of four French silver wine tasters of circular form, punch and fluted decoration, snake ring handles, three set with coins. 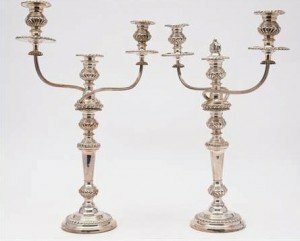 A pair of 20th century silver plated twin branch candelabra:, with urn shaped nozzles and gadrooned trays, on reeded swept branches issuing from a knopped tapering stem, on a gadrooned and weighted circular base. 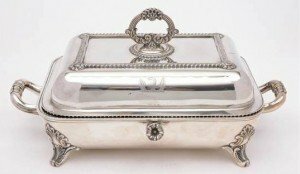 A plated warming dish and cover: crested, with gadrooned borders, reeded loop handle to the cover, having a floral decorated filler cap and raised on foliate decorated swept feet. 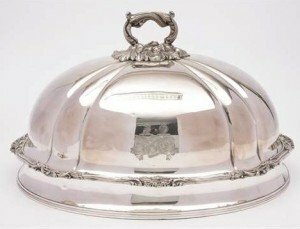 A late Victorian plated meat dish cover: crested, of domed oval outline, with foliate and scroll border, and foliate decorated loop carrying handle. 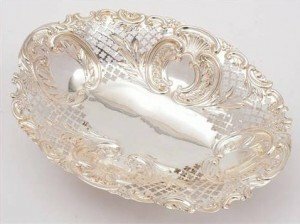 A Victorian silver bon bon dish, maker Edward Hutton, London, 1892: of oval outline, with pierced and foliate and scroll embossed decoration, raised on four swept feet. 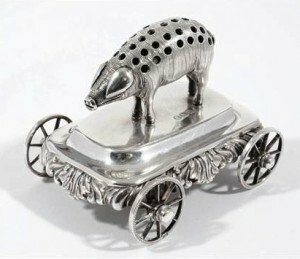 A rare late George III silver table top novelty toothpick holder, maker’s mark illegible, London, 1819: in the form of a pig, mounted on a rectangular four wheel trolley, with foliate decorated border.